One of the more popular full-size luxury SUVs on the market is known as the Volvo XC90. The new Volvo XC90 is a full-size SUV that works hard to provide drivers and passengers with greater levels of safety. To this end, the new XC90 includes special adaptive cruise control systems and automatic high beams in its design package. Gone are the old days when cruise control could only keep vehicles moving at one speed. 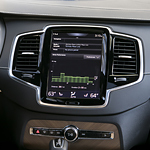 The Volvo XC90 luxury SUV brings a specialized adaptive cruise control system to the party. While no replacement for drivers, the adaptive cruise control system can back drivers up in some very important ways. For example, the adaptive control system can keep the vehicle moving at a constant speed while adapting to surrounding vehicles. Another onboard Volvo XC90 system that is helpful to drivers is the automatic high beam service. Volvo high-tech LED headlights can project high color-temperature beams for relatively long distances. For extra effectiveness, these special LEDs remain in the high beam position whenever the roads ahead are clear of traffic. If and when oncoming traffic does appear, this system can sense these oncoming vehicles and switch to low beam power until they pass.